You'd think it would be fairly simple. With loads of time available and 4 whole weeks to get organised, why have I once again left it until the penultimate day of the month to get in my planned bivi-per-month? To be fair, I did have one attempt earlier this month with a trip up to Aviemore. I was doing a couple of route surveys for Scotways and had opted for an overnight camp at the top of a wee hill. When I arrived there (in the dark) I found the spot I wanted under lots of fresh snow and a strong wind starting up. I instead opted to sleep in the van in a much more sheltered spot and was glad I'd made that decision as the van was still rocking all night and more snow arrived. This time, the weather looked more settled and I decided to do a "classic" Scottish MTB route - Bridge of Orchy to Loch Etive via Glen Kinglass. 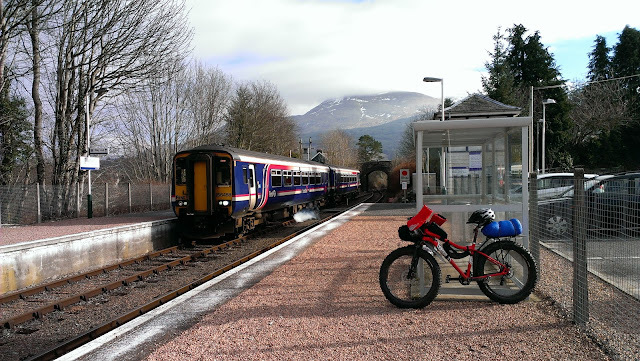 By way of an warm-up I headed off up the West Highland Way from Tyndrum. I was aware that the evening was going to be cold and had dressed accordingly but the lovely warm sunshine was already making me pay for it as the track first heads uphill. I was also on the Fatbike and finding the big knobby tyres at only 12psi pretty hard work. Once off the old road, the big tyres did make light work of the rocky section though it was very slippy going under the cattle creep and then I had to lift the whole bike and gear over the fence. 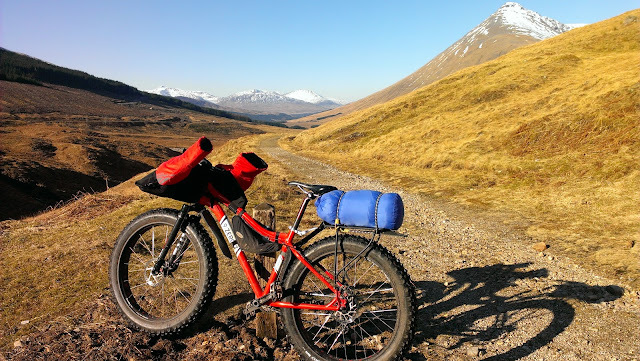 Back on the old road, I was soon down at Bridge of Orchy and then facing the climb up to Mam Carraigh. I can't help but feel that the gaelic speaker who named this high pass had a sense for a good pun as my legs gave in and I was reduced to pushing for a short while. Soon enough though, I broke out of the forest and could really appreciate the height gained for the wonderful views it provided. The descent down to the Inveroran proved to be a real delight - all rocky and slabby. Briefly on the road I was soon at the start of the track to Glen Kinglass and again made good time to the edge of the forest, passing a small area of burning grass on the way. I'd seen a larger area from the top of Mam Carraigh and that turned out to be right at the edge of the track I was on so I took a deep breath and blitzed past it as fast as I could. Once through the farm buildings at Clashgour I had a bit of a choice to make. The footpath led to a nice bridge but would involve a climb over a high stile with the bike. Instead, I opted to see what the ford was like. I was delighted to see a set of high stepping stones, mostly well clear of the water level, so hopped across these, pushing the bike through the river as I went. From there, the track carries on alongside the river for a while before it changes character rising up through the terminal moraine of a long-gone glacier. This was a lot more up and down now and I had a sense that the daylight was ending just as I approached the watershed and started my descent into Glen Kinglass. This turned out to be an absolutely fantastic piece of trail, with large slabby sections like a natural McMoab. Well worth all the effort to get here. A couple more river crossings were required, with one old footbridge looking very much the worse for wear and better bypassed. However, I now had three pressures on me; I needed to concentrate on the trail both for safety and enjoyment, I wanted to look around to enjoy the scenery and take photos, and I still needed to make good time before the sun set. More than once I'd look up at some lovely mountain view, look back at the trail and realise I was about to come a cropper. However, I somehow held it all together and reached Glen Kinglass Lodge in one piece. From here, the trail improved yet again and I decided to press on to reach the side of Loch Etive before camping. Would you like ice with that whisky? By the time I'd eaten and settled in for the night I was quite cosy and slept well until around 2:30 when I was awoken by the sound of barking. It was far too close to be any sort of estate dog so I can only assume it was a fox giving something a hard time. I popped my head out of the tent, hoping for a nice moon but it had clouded over. Just after 7am I was awake again and settled for a cup of coffee and porridge bar for breakfast before packing everything up and heading along Loch Etive. This track proved to be much hillier than I'd expected and I was glad to finally see the outskirts of Taynuilt. I had a wee walk around Bonawe Furnace before heading for the village teashop, which turned out to be closed. With few other options available I grabbed some food and drink from the grocery and headed down to the station platform where I knew there were a couple of shelters. I had the notion I might even get my stove out to make an impromptu brew but the warm sun and a bench were good enough and I simply relaxed awaiting the train back to Tyndrum. Another fabulous run and a route I'd repeat as a one-day option some time. Now then - maybe I should plan the March bivi night soon?